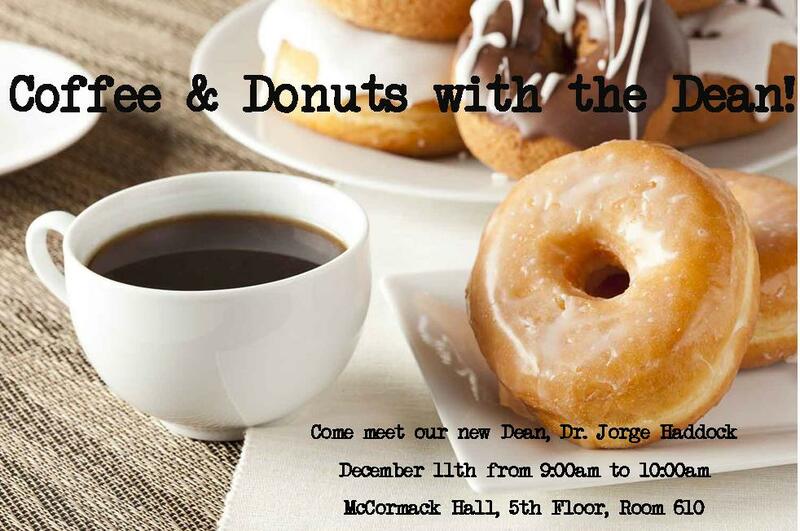 Come meet our new Dean, Dr. Jorge Haddock on December 11th from 9-10am in the Dean’s Conference Room (M-5-610)! Comments Off on Networking Event Registration Deadline is Wednesday December 10th! Networking Event Registration Deadline is Wednesday December 10th! The deadline to RSVP for the Employer Networking Event is fast approaching! Make sure you RSVP with the Office of Career Services and Internships by Wednesday December 10th! The event is Thursday December 11th from 4pm to 6pm in the Alumni Lounge of the Campus Center, and is worth MAP miles! Are you prepared? Have you researched the companies who will be attending, and have a game plan for talking with each of them? Have you polished your resume? Make sure by bringing your resume to a Resume Quick Check! Do you have an elevator pitch (15-30 seconds on who you are and what you’re looking for?) Are you planning to bring something professional to collect things in? (A bag or pad-folio can go a long way!) Check out the Networking MAP workshop tomorrow at 11am in the Campus Center 2-2545 for more helpful hints! RSVP here. And, last but not least, are you prepared to be professionally dressed? Business etiquette for professional attire can vary based on gender. Here are some helpful tips when considering attire for the Networking Event. Men: Your suit should fit, be ironed, nicely tailored, and conservative regarding color choices. A tie is almost always a good idea, and make sure you have shined, closed-toed shoes (with matching socks) as well. Your shoes and belt should match, be careful of too much cologne, and make sure your facial hair is kept neat. Piercings and tattoos should be minimized or covered if possible. Women: Your suit should fit, however, pants or skirts are both appropriate. It should be ironed, nicely tailored, and be conservative regarding color choices and patterns. Avoid distracting jewelry, revealing clothing, overpowering perfume, and makeup that could be considered distasteful. Shined, closed toes shoes with low heels are recommended (you will be standing for some time). Need examples of professional dress? Click here! Reminder, check IN with Career Services at the entry to the Alumni Lounge in the Campus Center, and check OUT for MAP miles in the lobby after you’re finished. We will start checking out at approximately 4:45pm, so you should plan to spend some time with all the employers in the room! These are the MAP Events for the Week of December 7, 2014. Comments Off on Networking event December 11th, Professional Dress Required! Networking event December 11th, Professional Dress Required! The Employer Networking Event is next Thursday (December 11th) from 4pm to 6pm in the Campus Center! Are you prepared? Have you registered and researched the companies who will be attending, and have a game plan for talking with each of them? Have you polished your resume? Do you have an elevator pitch (15-30 seconds on who you are and what you’re looking for?) Are you planning to bring something professional to collect things in? (A bag or pad-folio can go a long way!) And, last but not least, are you prepared to be professionally dressed?